On October 2015, Google confirmed using Rankbrain (a search engine algorithm that was powered by an AI) for their search engine. Search experience for a common user changed very much after that, and it became more difficult for SEO experts to work and to rank their clients site on top and that’s how artificial intelligence transformed SEO. 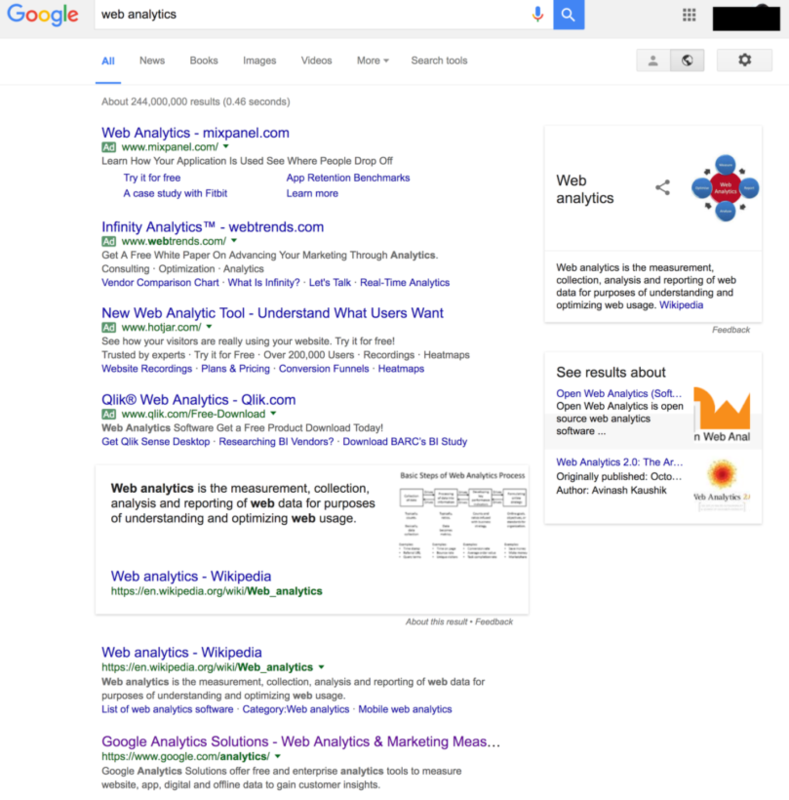 Look how below Google Analytics is ranking when we searched for web analytics on Google Search. 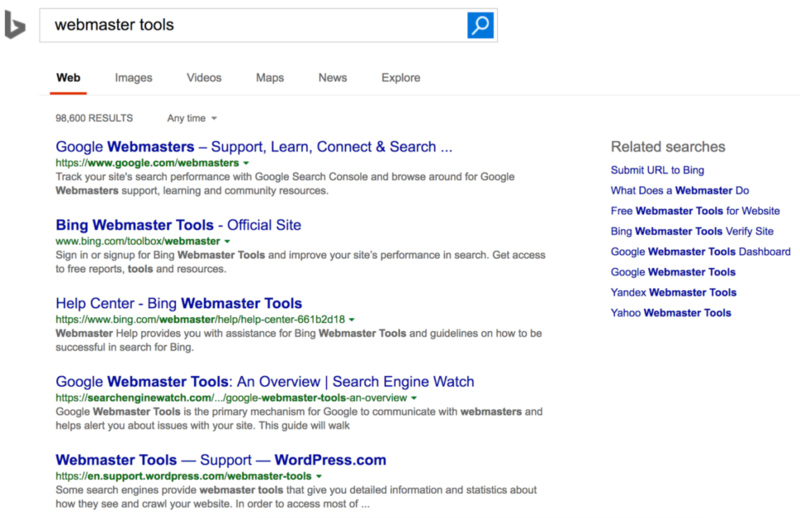 So, this is how Bing is reacting when searched for webmaster tools, beating google webmaster in the rankings has became tough for bing analytics on Bing Search. So how to tackle Artificial Intelligence Transformed SEO? In the past, when there was a big change in rankings, analysts would evaluate which types of websites were affected and then declare that Google’s latest algorithm change was due to content quality, backlink profiles, or whatever else. But thanks to RankBrain, these generic SEO declarations are no longer accurate. Why? Because RankBrain uses a different combination of core algorithms depending on each specific query. For one keyword, RankBrain might decide the META title is the most important clue to pay attention to, while another query may call for more emphasis on backlinks. Therefore, ranking factor analysis now requires you to review only the history for keyword-specific searches. Another impressive ability of RankBrain is to evaluate which sites are considered good and bad within a specific industry. The artificial intelligence studies the layout, settings, features, content, etc. for each industry and essentially makes the good sites a template in which to compare all other sites in that vertical. For example, it knows that WebMd is a reputable site in the health industry, so when it detects a site similarly laid out with similar keywords, it may assume that that site is also high quality. What this means for you is that you need to study and try to emulate (in your unique way) the sites that are highly regarded in your industry. This also means that generic sites can be easily misclassified. If it’s not clear to RankBrain what your site is about, it might associate you with a spammy site in one industry instead of a high-quality one in another. To avoid this, keep your site niche. Just like RankBrain is creating layout templates within industries, it is also evaluating the backlink profiles. The artificial intelligence algorithm evaluates what other sites the company is receiving backlinks from, so it considers links from these sources as good-quality links. For example, let’s say it has determined a high-ranking website that sells shoes receives backlinks from sites about sports, fashion, and even health. It determines that this is that industry’s linking neighborhood. So now let’s say you also have a shoe ecommerce website and you want to improve its SEO. Luckily, you have a friend in the auto industry who is willing to give you some backlinks. But when RankBrain evaluates your site and sees these links, it will realize that other reputable shoe sites don’t have links from auto sites, and it will assume your links are spammy. Yes, even if you went about it the correct way and they are, in fact, perfectly legit. So even if you do have connections outside of your related industries, skip the backlinks. It could do more harm than good now that artificial intelligence is involved. Artificial intelligence is continually changing SEO. While some aspects are great, some can make it more challenging. Essentially, there are no more loopholes. If you do things the correct way, paying attention to the high-ranking sites in your industry, you have nothing to worry about. In a nut-shell, employing the SEO practices that are a class apart you can change the optimization of the search engines to reap nothing but the best out of the Google’s ANI RankBrain algorithm to boost website rankings for a satisfied client experience. Don’t forget to read How To Use Social SEO To Increase Website Ranking and How To Improve SEO In 2017.